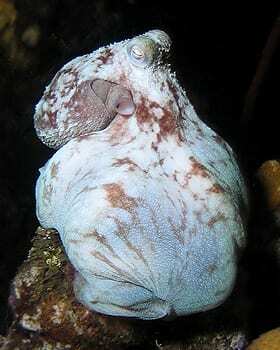 Caribbean reef octopuses, Octopus briareus (Robson, 1929), aka reef octopus, are characterized by their distinctive blue-green colors with occasional mottled-brown markings. 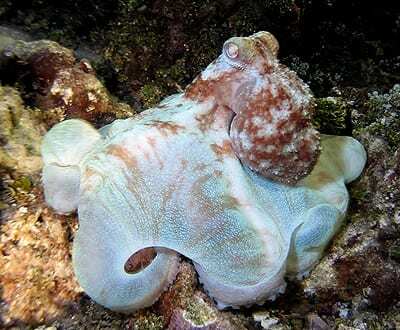 Like other octopus species, Caribbean reef octopuses are typically solitary and are able to quickly change color using specialized cells in their skin known as chromatophores. These amazing cephalopods have been measured to 12 cm (mantle length) with arms to at least 60 cm. They can weigh up to 1.5 kg. 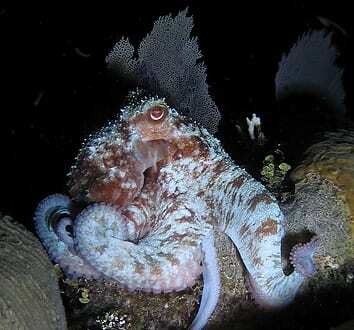 Caribbean reef octopuses are common throughout the Western Atlantic, Bahamas, Caribbean and the coasts of northern South America. They are nocturnal hunters and are often found out at night searching for prey among reefs and seagrass beds. Because their blue-green skin is so reflective, they are easy to spot at night with dive lights. 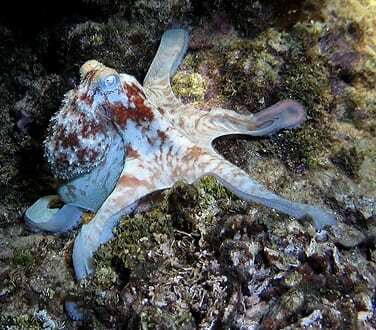 Octopus briareus feeds on a wide array of animals including primarily crustaceans as well as small fish and bivalves. This intelligent species often feeds by spreading its webbed arms to form a canopy to net its prey. 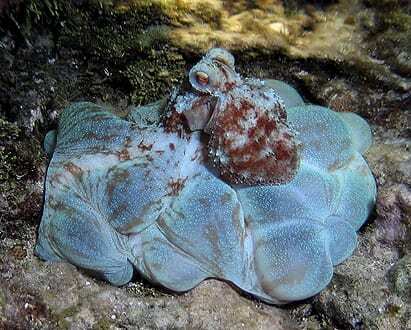 Caribbean reef octopuses reproduce sexually. 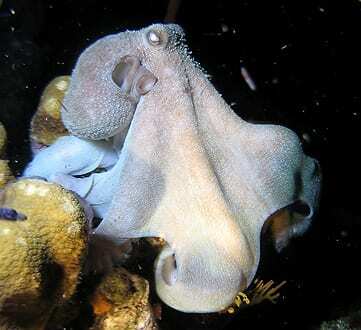 Males and females are similar in size, color and behavior except for the presence of hectocotylus (a modified arm of the male of certain cephalopods, such as the octopus, functioning as a reproductive organ in the transference of sperm to the mantle cavity of the female) in males. Fertile females collected from the Florida Keys have been observed laying approximately 500 large eggs around January. After about 50-80 days (quicker in warmer waters) the eggs hatch. The hatchlings are able to move like adults using jet propulsion and they can also eject ink and crawl like adults. 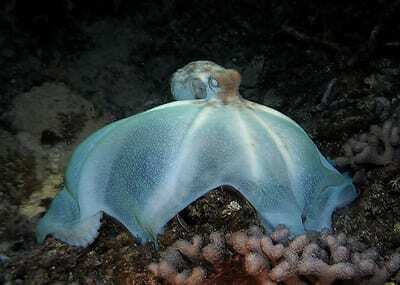 The young octopuses grow very quickly and within about 17 weeks the young reach about 75% of the adult size. 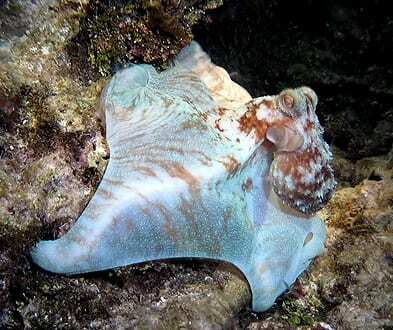 Male Caribbean reef octopuses are sexually mature in 140 days and females in 150 days. They can be easily studied and bred in laboratories. Hanlon and Forsythe (1985) have found that O. briareus is cannibalistic in group culture though.